Last Friday, the people who are making No Man’s Sky told me they’d been late to a meeting with Steven Spielberg. The legendary director waited, though, because he—like millions of other people across the world—was fiending to play No Man’s Sky. No pressure, right? The reason Hello Games’ away team was late showing their space exploration title to ET’s daddy? The blame lies squarely on Elon Musk. Yes, the billionaire who’s putting electric cars on the road and rocketships in space just had to see the game, too. Me? I was choking on Los Angeles smog as I waited for studio co-founder Sean Murray to wrap up the demo meetings scheduled to happen before mine. Hello Games wasn’t stationed at the Los Angeles Convention Center during E3, choosing instead to rent out a penthouse apartment close-by. You could see the convention center from their perch but it seemed, appropriately, a world away. You can only have one ship and one weapon. Each one will support modifications to make them uniquely functional, with various ships offering a different number of inventory slots. So, players won’t be amassing a fleet of vessels in this game. Upgrading handheld weapons will help with mining, too. Harvesting resources will be a big part of the game’s economy. The millions of planets in No Man’s Sky will be home to unique natural resources and elements, which sit on a made-up periodic table. You’ll be able to scan for them and then blast outcroppings or underground deposits to claim the shiny minerals. You’ll be able to sell these resources in their raw form or combine them into bespoke alloys that might be even more valuable. They’ll also be used for crafting upgrades. A vanilla spacesuit isn’t going to cut it. The default protective garb players start the game off with won’t be all-purpose. You’ll need to buy and upgrade survival gear for toxic, radioactive and frozen planets. There won’t really be a traditional story. Instead, Murray told me, there’s a layer of lore undergirding the exploration. For example, the Sentinels patrolling the planets you visit were made by an ancient race and seeded throughout the galaxy to preserve the delicate balance of planetary ecosystems. But the Sentinels are a bit out of control, Murray teased, hinting at a thread of lore that may be lying in wait for players to discover. Mess around too much and your wanted level rises. If players destroy too much of a planet’s geography or wildlife, the Sentinels will hunt you down and try to make you pay. Similarly, attacking trade ships as they try to dock into space stations can draw out fleets of enforcer vessels ready to blow you to bits. 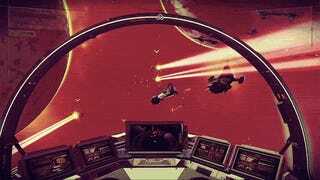 The time I spent playing and watching No Man’s Sky left me feeling like the PS4/PC title will be more meditative than anything else. Yes, there were explosions and dogfights and giant robots bearing down on me during that session. But, as my ship skimmed over the red oceans of one planet and I walked through the mushroom grass and watched overgrown rabbit creatures skip past, I started to think of No Man’s Sky as a giant book that will live inside my PS4. If all goes well, I’ll be able to play through a chapter or two every night, come away with a weird thing to show for my travels, and compare notes with fellow adventurers. That’s all I want right now. There&apos;ll be more to do when you get to the nexus of the cosmos in No Man&apos;s Sky.